The most obvious difference is the package. It came in a 48-pin Quad in line package. The massive package alone (for a 4-bit processor) likely stifled its success. 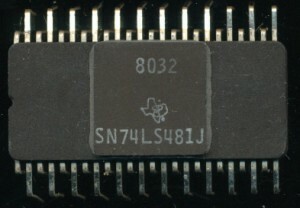 The large amount of pins though were required for its 3 data ports, address port, and a 10-bit operation selection bus. It supported no less then 24,780 unique functions and was completely microprogrammable via an on chip PLA. It had built in algorithms for both multiply and divide as well as CRC (useful for error detection). The PLA could be programmed with customers own instruction set allowing it to fit whatever processing needs were required. The ‘481 also included a Program Counter, (unlike the 2901 or even the AMD 29116). The 74S482 was needed only to handle context switches (jumps, returns, stack operations, and the like). One interesting feature of the ‘481s was a special pin that the processor could use to determine its position in a multichip system. When pulled high the 481 acted as the MSP (most significant position), when grounded, the LSP, and when biased at 2.4V it was configured as an intermediate position. This is many ways could simplify designing N-bit systems, as the intermediate processors always behave the same, and the most and least specific position have to handle data slightly differently (for carries, overflows, etc). TI SN74LS181N – 1972 – 4-bit ALU. Used in a similar role, but required a lot more support logic. TI marketed the ‘481 as having the ability to ‘efficiently emulate existing systems.’ The idea of the ‘481 was to be able to take an old computer/system design, and simplify its control to a series of ‘481s, however many were needed to match the bit size of the computer being redesigned. TI themselves did this with several iterations of their TI990 computer line, using quad ‘481s to make the 16-bit processor design. The original 74S481 ran at 10MHz and consumed 345mA of current. 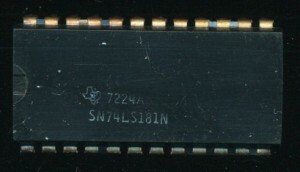 TI quickly followed with a low-power Schottky version, the SN74LS481 that ran a bit slower at 8 MHz but consumed only 220mA. Military spec versions were made as well, and following the standard TTL naming, were 54S/LS481s. 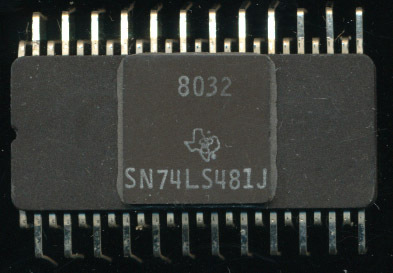 It also was eventually made in a plastic 48-pin DIP (the SN47S481N), likely to try to bring the price down as well make assembly easier. Likely owing to the competition from others, as well as a lack of second sources, the ‘481 did not achieve any great market success outside of TI’s own designs. By 1986 TI had stopped marketing them, though ironically the 74S482 continues on for a few more years, likely as it could be used with other bit-slicers or even designs using the ‘181 ALU. Those were used on the TI 990 minicomputers as the core CPU-ACU cards and 990 disk controllers.